In many countries it is illegal to dock a dog's tail or crop a dog's ears, also in order to participate in dog's show a Rottweiler should have a natural tail. A Rottweiler's natural tail is carried hanging while at rest, and often over the back when excited. It normally has a slight curve. A Rottweiler dog does not hold it's tail in a stiff position sticking straight out from the body but instead it can be captured appearing to stick straight out by a camera, with the picture taken at exactly the right moment, as the tail wags back an forth. 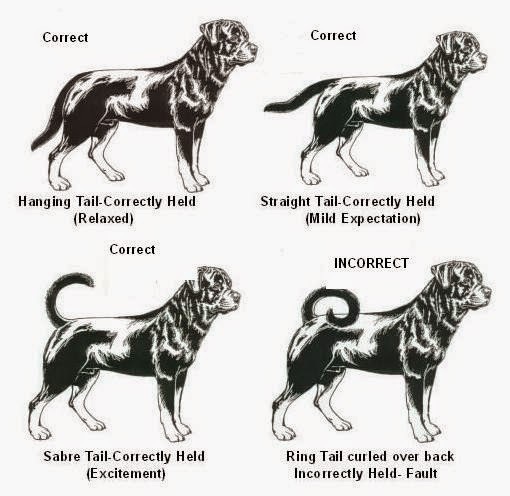 These are the Correct ways a Rottweiler keeps his tail !